Got mold? Dead critters? Staining on your roof? Mold on your siding? Horrible subfloor urine? USPS or common carrier without penalty. But the real magic of Omnisept — and what makes it outperform other products that carry far stricter precautions — is the proprietary Booster, which accelerates the oxidizing action of the Concentrate, thus dramatically increasing its efficacy and allowing it to go to work immediately. 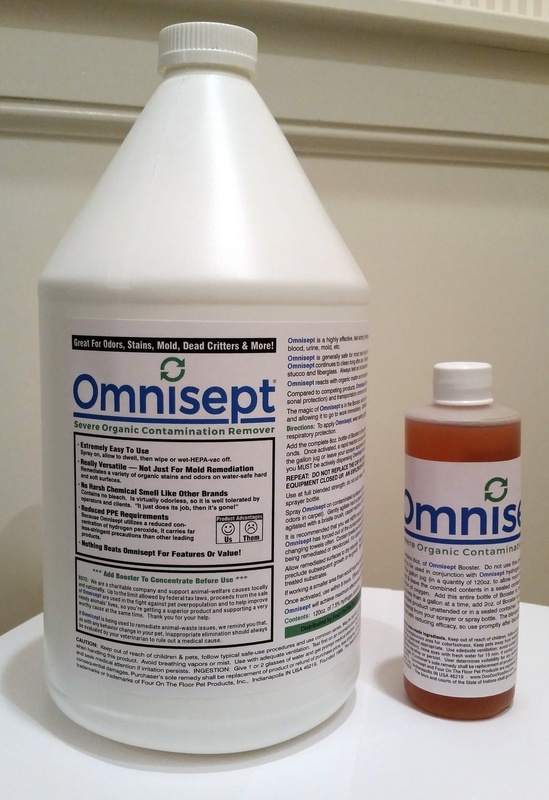 Omnisept performs as if it were much stronger than it is, yet contains no bleach, has no odor and is well tolerated. When Omnisept is finished doing its job, it naturally breaks down into water and oxygen. With proper technique to remove the loosened contaminants, there is nothing left but a clean surface. Shown In The Photos: Starting with the upper left photo and moving across and down, (1) Moldy joists in a basement contaminated with multiple species of mold, as verified by testing. (2) An adjacent joist during remediation with Omnisept. Notice how Omnisept foams the contamination loose, making it easy to wipe or HEPA vacuum away. (3) Adjacent framing members after remediation. They’re 27 years old, but now look like new. (4) A spa filter that had grown mold in an adjacent room. (5) The same filter after treatment with Omnisept, looking like new. (6) A pile of dead mice, found at the bottom of a stud cavity in the same room as the above-pictured joists. (7) The same stud cavity after remediation with Omnisept. As you can see for yourself, Omnisept is phenomenally effective at killing mold and removing all manner of accumulated organic stains. What you can’t see here, though, is how effective Omnisept is at remediating horrible odors that go along with these sorts of environmental contaminants. Directions: Use Omnisept full strength; do not add water. Add the complete 8oz. bottle of Booster to the gallon jug (which contains 120oz. of 7.5% commercial-grade hydrogen peroxide) before use. If working a smaller area than would require a full gallon, you can mix small amounts as needed; use 30oz. peroxide Concentrate and 2oz. Booster to fill a quart-size sprayer bottle. Gently stir in the Booster to evenly distribute it within the peroxide Concentrate. Apply with a trigger-sprayer bottle or a pump-up sprayer. Once the Booster is added to the Concentrate, a rapid reaction occurs which emits large quantities of oxygen. Because of this, it is imperative that you NOT re-cap the gallon jug or leave your sprayer equipment closed up. Doing so will result in an explosion due to pressure build-up. Once activated, you MUST be actively dispensing Omnisept from its container, so as to release the oxygen emitted. Omnisept will achieve maximum effectiveness on surfaces below 18% moisture content. Spray Omnisept on contaminated surfaces and keep them moist for as long as possible (20 minutes minimum). While not generally necessary, you can gently agitate the surface with a bristle brush if desired. HEPA wet-vac off the foam emitted, as it contains the organic contamination which Omnisept has forced out of the contaminated substrate. If no HEPA wet-vac is available, use a conventional wet-vac or wipe away the foam and contaminants with fresh paper towels, changing towels often. Contain used towels per common professional guidelines and quickly remove them from the structure being remediated. Because there is residual efficacy while Omnisept dries, we do not advise accelerated drying of treated substrates. Allow remediated surfaces to dry naturally. But, if the treatment area lacks light and ventilation, utilize an air mover to improve airflow and preclude subsequent re-growth once the product has substantially dried naturally. You can see the usage precautions and guidelines at the bottom of this page. They may sound scary to a non-professional, but they are more common sense than anything. Shown here are photos of Omnisept's chemistry (on the right) versus four popular products used by professional mold remediators. In side-by-side tests, Omnisept's chemistry beats the competition hands down, even though the competing products are more hazardous and carry stronger PPE (personal protection equipment) warnings. As the photos clearly show, Omnisept's accelerated chemical action powers through the wood samples’ tough mold, mildew and aging far better than the leading competing products. Because of Omnisept's brilliant chemistry, it works in a supercharged way. So, even though it’s approved for common shipment via UPS, FedEx, etc., which other leading professional brands aren’t (due to their high percentage of hydrogen peroxide), its performance leaves the competition in the dust. In addition to its usefulness with mold remediation, Omnisept is also appropriate for removing organic soiling from vehicles, building exteriors, roofs and more. Works Better, Yet Costs Less! The professional products shown can cost far more than Omnisept. Why pay more for reduced performance? The professional-grade products shown here are staples of the remediation industry and are typically only available through the professionals-only distribution channel. But now the power of Omnisept is available to homeowners and others. Even though you have access to such a pro-level product as Omnisept's, that doesn’t mean that you don’t necessarily need to engage mold remediation experts for your project. Mold is dangerous to your health and is nothing to mess with. Professionals have intricate training that consumers do not, and there are many aspects of mold remediation for which prudence dictates the inclusion of licensed, certified professionals. For instance, an industrial hygienist should be consulted so as to better quantify the seriousness of your issue, and to help determine its cause. Additionally, licensed professionals are well-versed in containment procedures, negative airflow, HEPA air scrubbing and more that are important safety concerns during any mold remediation job. Because of these factors, we urge you to consult professionals before beginning a mold remediation job. If you choose not to engage professionals for your project, we urge you to study up on proper containment techniques, PPE (personal protection equipment), HEPA air scrubbing, negative airflow and other pertinent factors. We, the distributor of this awesome product, assume no liability for your use of Omnisept or the other factors that pertain to your particular situation. We have used Omnisept for multiple remediation projects and absolutely love it. You will, too! It was highly effective and saved us a ton of money versus some of the other professional-grade products mentioned above, of which we bought a few hundred dollars' worth. Having used them alongside Omnisept, we preferred Omnisept. Omnisept is available in single 1-gallon jugs and cases of (4) 1-gallon jugs. Both include (1) 8-oz. Booster bottle per gallon jug. Omnisept is $44.90 per RTU gallon and includes FREE FedEx ground or USPS shipping. A case of (4) RTU gallons is $165 and includes FREE FedEx ground or USPS shipping (you save about $15 versus buying four individual gallons). Both ship to the continental USA only. Limited supply, so act now! To download the Omnisept 1-page cutsheet, click here. To download the Omnisept Gallon label, click here. To download the Omnisept Booster label, click here. 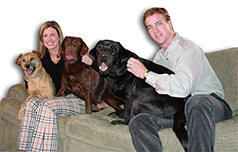 Distributed by Four On The Floor Pet Products, Inc. 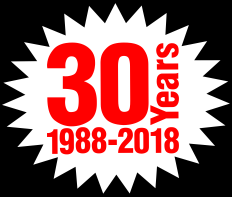 Founded in 1988, we are a charitable company and support animal-welfare causes locally and nationally. Up to the limit allowed by federal tax laws, proceeds from the sale of Omnisept are used in the fight against pet overpopulation and to help improve needy animals’ lives, so you’re getting a superior product and supporting a very worthy cause at the same time. Thank you for your help.